Two years ago, Teylers Museum began to realise this longstanding dream: hosting the first major exhibition in the Netherlands with real drawings by Da Vinci. Leonardo’s work is spread around the world in many different collections and museums. It is not easy to obtain it on loan. However, a sufficient number of contracts have now been signed so the exhibition can go ahead as planned: from 5 October 2018 until 6 January 2019. Even during his lifetime, Da Vinci (1452-1519) was famous for his unrivalled talent to portray human personality traits and emotions in a convincing way. He was one of the first artists who was fascinated by the relationship between inner personality and outward appearance. This can be seen not only in his famous paintings, including the Mona Lisa, but also in the dozens of drawings of human faces that he made. In The Last Supper, Leonardo has applied all his knowledge about expressing emotions and personalities. From the moment of completion, the mural painting has been famous thanks to Leonardo’s ‘typecasting’ of the apostles, and because of the lively and convincing way in which he has portrayed the wide range of responses to the words of Jesus. These include: confusion, shock, surprise, anger and sadness. Never before has an exhibition focused on this crucial aspect of Leonardo’s work. The specialist in this field is Michael Kwakkelstein, Director of the Dutch University Institute for Art History in Florence, Italy and former curator at Teylers Museum. He will act as guest curator. The works on loan have been obtained from collections of her Majesty the Queen, United Kingdom; the National Museum in Budapest, Hungary; the Albertina in Vienna, Austria; the Louvre in Paris, France; and from many other institutions. The museum is expecting a total of several dozens of drawings by Leonardo himself and a number of works of art from his followers. With it being a mural painting, The Last Supper cannot travel to the Netherlands of course, but it will be present in a very special way at this exhibition in its original size. 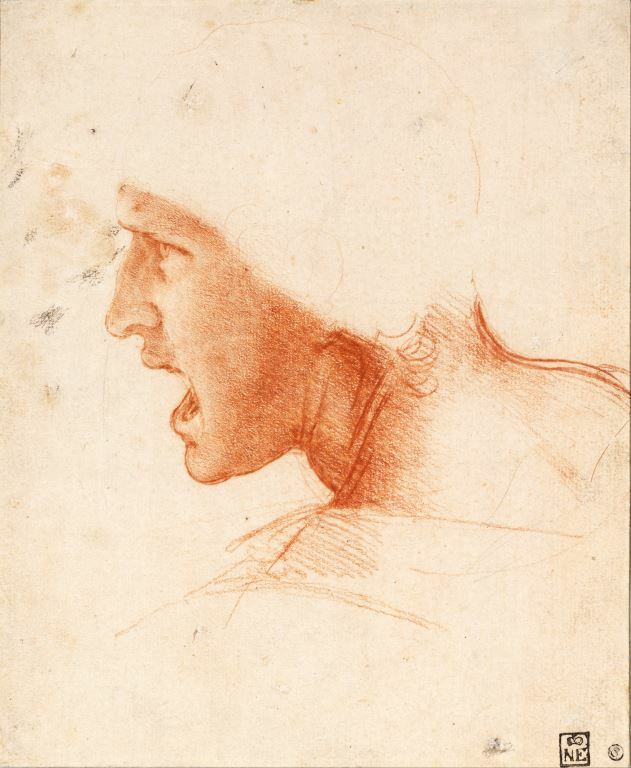 Image: Leonardo da Vinci (1452-1519), Study of a warrior’s head for the Battle of Anghiari, Szépművészeti Múzeum (Museum of Fine Arts) in Budapest, Hungary.